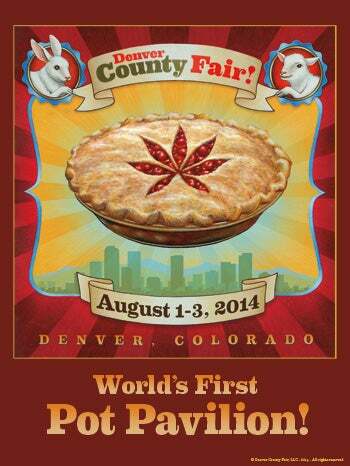 Nobody told me, maybe because I'm a thousand or so miles away, but the Denver County Fair had the world's first Pot Pavilion. It sounds like a good time was had by most, but at least one thing went wrong. Thankfully, it appears to have been an accident. First, the good news: the Denver County Fair had a Pot Pavilion, where vendors showed their wares and those so motivated could compete. Prizes were awarded in several categories including Best Plant (Commercial & Homegrown), Best Bud, Best Bong or Pipe, Speedrolling (using oregano; no marijuana on the grounds) and prior to the fair, judges gathered at an offsite location to select winners in several edible categories. Unfortunately, it seems one vendor (LivWell) somehow had laced samples get through their screening and for at least some time, it appears they distributed chunks of chocolate containing marijuana. Because the samples were supposed to be pot-free, those who have come forward have said that they ingested a very large dose. Still, I hope they have it next year, I'd like to go.